Published By: Frederick J. Drake & Co. Condition: Softcover Edition. Shows wear and some separation from binding. 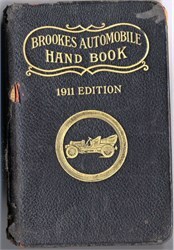 Contents: A Work of Practical Information for the Use of Owners, Operators and Automobile Mechanics with graphics. Includes Road Troubles, Motor Troubles, Carburetor Troubles and Ignition Troubles. Giving Full and Concise Information on all questions relating to the construction, care and operation of gasoline and electric automobiles. With numerous tables, useful rules and formulas, and over one hundred illustrations.